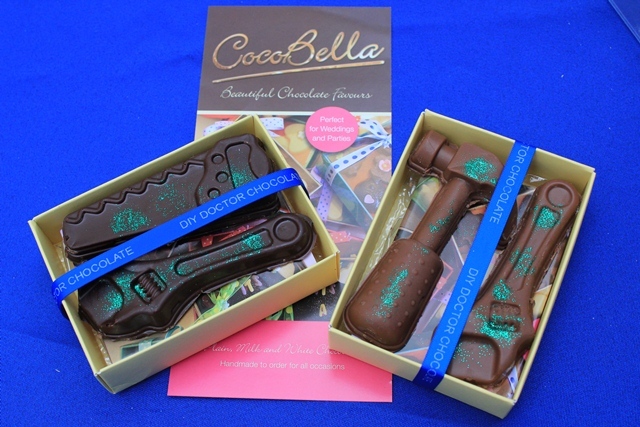 Coco Bella create chocolate ‘favours’ for any occasion and they have been our partners at the National Home Improvement Show this weekend. Their lovely chocolate hand tools have proved to be a real hit with the crowds here at Olympia. We are gearing up to sell these lovely little tools in time for Christmas – while we can’t guarantee that the tools will work very well, we are sure they will go perfectly with a cup of builders tea, and a nice sit down in between jobs. An ideal reward for the DIY enthusiast in your life (or even a bribe if that is more effective in your house!). The chocolates are approximately 10cm long and include hammers, saws, spanners and screwdrivers in milk, white and dark chocolate, sprinkled with a little festive edible glitter. Each gift pack contains 2 tools and costs around £3.50, an ideal stocking filler. As soon as they are ready for Christmas orders we will let you know. In our customers’ interests we have had to quality control the chocolates to make sure they are edible. The consensus is that they are delicious. They are satisfyingly chunky and each shape is a solid piece of chocolate – no disappointing hollow bits. The DIY Doctor blogger knows you will appreciate this attention to detail and the selfless pursuit of customer satisfaction involved in ensuring you are completely happy with the products we sell!